After the DLO Jam Jacket with headphone management, the DLO Jam Jacket case with multiclip is another iPod touch silicone case from Digital Lifestyle Outfitters. 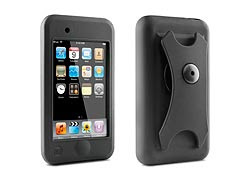 The most outstanding features for this iPod touch case is the integrated multiclip -- it can function as a desktop stand, a belt clip, and provide cable management capabilities. Besides the multiclip, this version of Jam Jacket iPod touch case also comes with a Surface Shield screen protector which make this case a complete protection package to your iPod touch. If you are wondering how does the multiclip of Jam Jacket works, the photo below shows you how it works as a desktop stand, a belt clip, and providing cable management capabilities. The DLO Jam Jacket iPod Touch Case with multiclip currently cost $19.99.